By Xah Lee. Date: 2010-09-03 . Last updated: 2019-04-06 . ASCII characters are those with Unicode codepoint from 0 to 127, inclusive. They are mostly the symbols you see on computer keyboard. Codepoint 0 to 31, and 127, are control characters or non-printables characters. (including space, tab, newline characters). Also, codepoint 127 is DEL, usually the signal sent by the ⌫ Backspace key or ⌦ Delete on keyboard. Unicode has glyphs to represent ASCII non-printables characters. Unprintable Characters can be represented in multiple ways. By decimal, hexadecimal, by standardized abbrev, or Unicode glyph, or caret notation, and in programing languages some have C escape syntax in string. 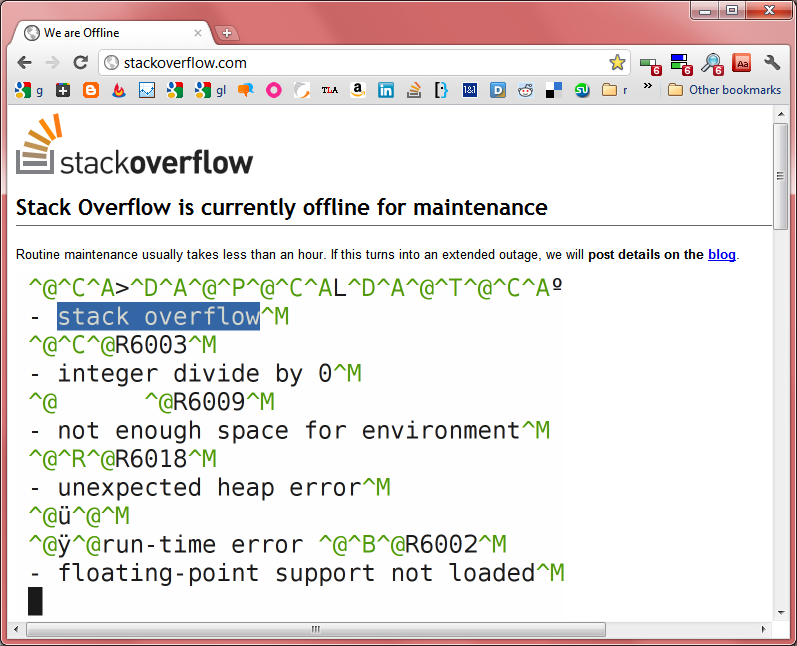 Stack Overflow Offline Page (2011-08-06T13:49:05-07:00) showing unprintable ascii character, by caret notation. Note that the ^M represents the ASCII 13, carriage return. Any ^ followed by a letter represents a ASCII non-printable char. The ^@ is ASCII 0, the Null character. Here are other character representation symbols. They are often used in text editor or word processor to indicate whitespace.